On the day of our arrival in Santiago de Compostela, we got a message from Tania that made us laugh. She said waiting for us to reach Santiago was “like waiting for a couple of babies to be born!” We are happy to announce that although the labour was long, the delivery went smoothly. The babies arrived at 10:30 this morning! They (make that “we”) will be spending two nights at the Hospiteria San Martin Pinario, a renovated monastery built in the 16th century and located as close to the Cathedral as you can get. Our arrival in the city was a happy/sad time. 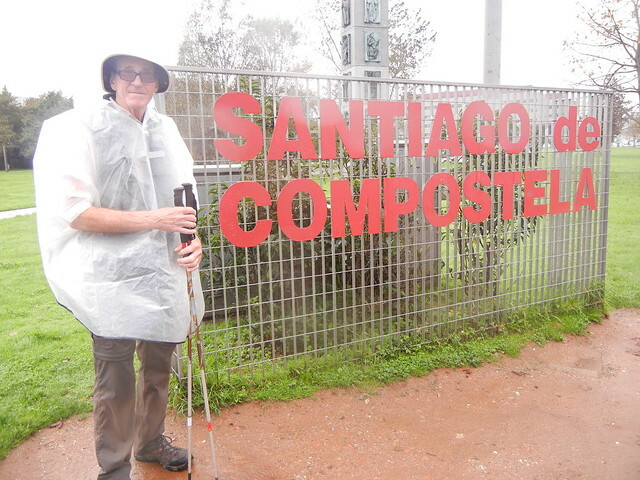 The rainy weather we got while walking into Santiago was consistent with my feelings of sadness that this amazing experience of walking the Camino de Santiago was coming to an end. It was the journey of a lifetime. How often do we get to be in a crowd of people all walking in the same direction and along the same path. Even though we don’t all speak the same language, there is an unseen bond between us. How wonderful it would be if all the world got together like this with one goal, one path. 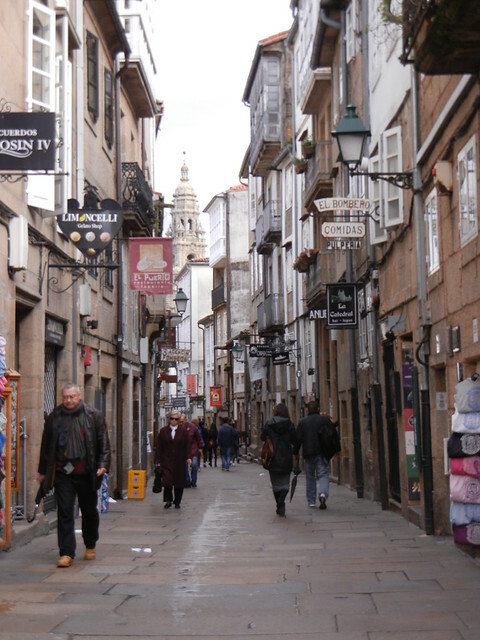 There were also feelings of excitement and happiness to see the big red letters “SANTIAGO DE COMPOSTELA” as we entered the city. I literally got goosebumps and became one big porcupine! What a powerful physical effect an emotion can have. We followed the scallop shells along the sidewalks towards the Cathedral and eventually got our first glimpse down a narrow lane at one of the towers. What a disappointment it was to see that it was surrounded by scaffolding! Later we learned that during the last restoration seventy years ago, concrete was used as a filler. The concrete has since cracked and caused water damage, so it must now be painstakingly removed. There are 25 workers doing the job. It took ten months to restore one tower to its former glory and now work is taking place on the second tower as well as on the Portico of Glory above the main doors. We couldn’t check in at the hotel until noon, but were able to leave our backpacks there before heading to the Cathedral. 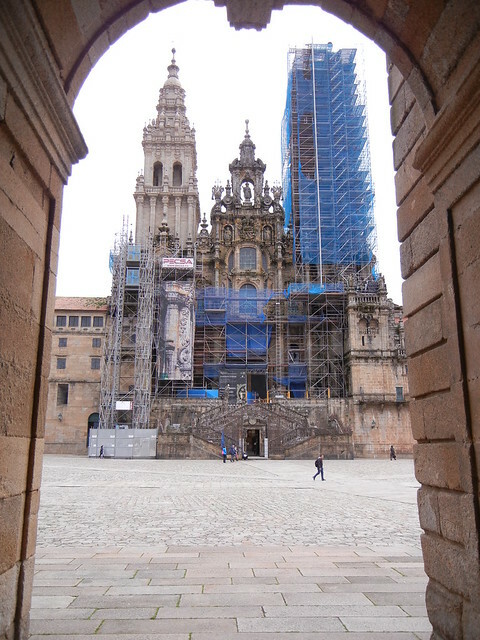 We could walk up the front steps, but access to the Cathedral via the front entrance is prohibited as a result of the restoration work taking place above. We arrived in good time to get a seat for the Pilgrim Mass at noon. There is seating for 1,000 people, but there weren’t enough seats for everyone. 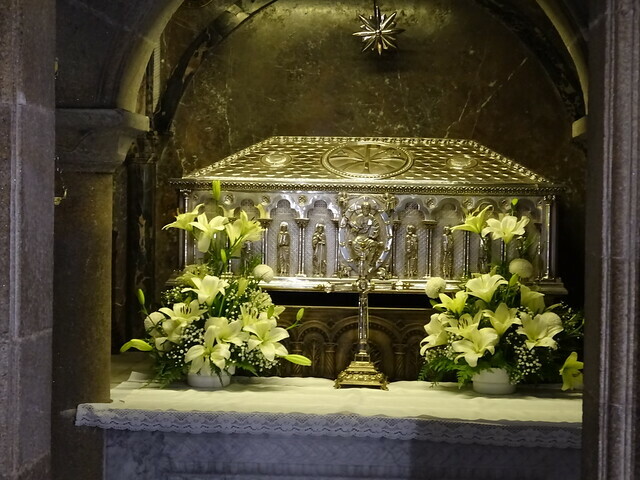 Mass was in Spanish so the meaning of what was spoken was lost on us, but the beautiful voice of the nun who sang could be appreciated no matter what the language. Her angelic voice filled the Cathedral. This is kind of funny! 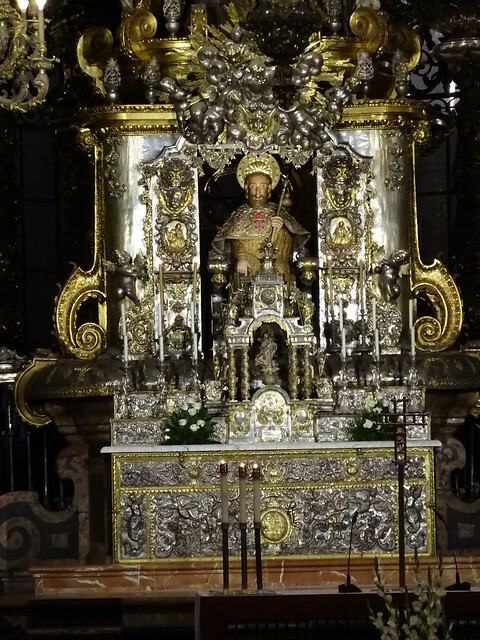 We were distracted during Mass by what looked like someone reaching around and cleaning St. James’ statue from the back. “Oh, too bad they couldn’t do the cleaning at some other time!” we thought. As it turned out, it wasn’t someone cleaning St. James, but people touring the Cathedral hugging him, even during Mass. 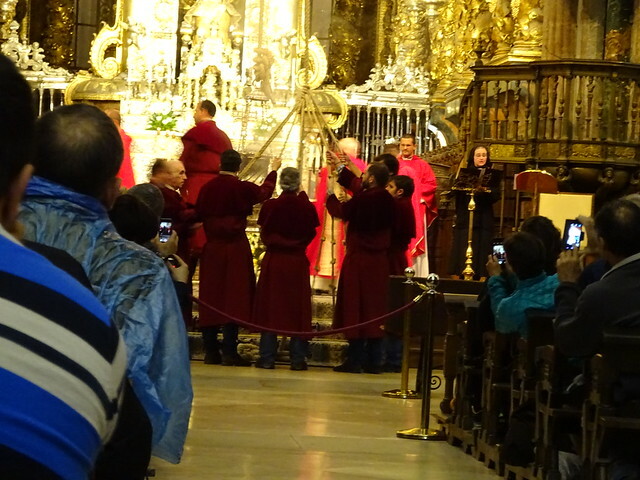 When Mass was over, eight men in burgundy robes filed in and lowered Botafumiero, getting ready to swing it. Botafumiero means “smoke expeller” in Galician. 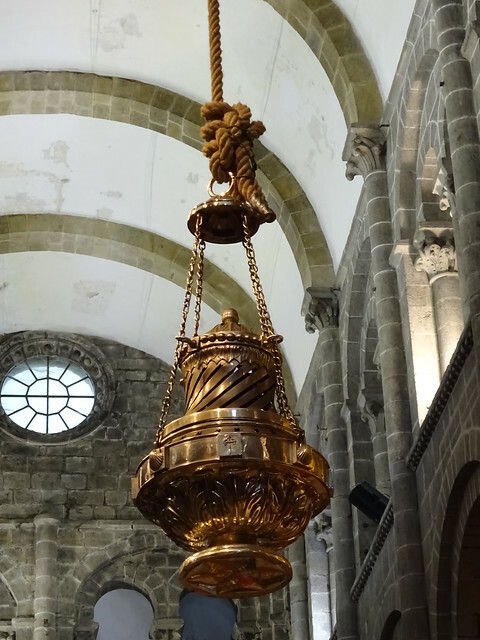 It is said that the use of a swinging censer like this in the Santiago de Compostela Cathedral began in the 11th century to help cover the stench of arriving pilgrims who were unwashed. It was also believed that incense smoke had a prophylactic effect in the time of plagues and epidemics. 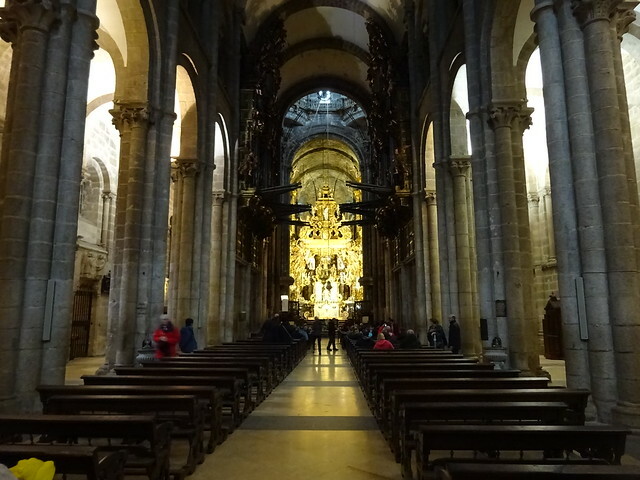 People seated in the transept of the Cathedral would have had the best view of Botafumiero swinging all the way from one doorway to the other at each end of the transept. As it swings, it dispenses thick clouds of incense. 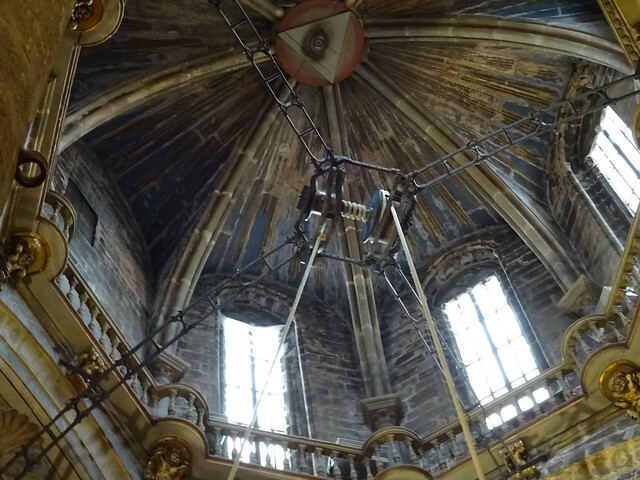 The swings reach heights of 21 meters, almost to the ceiling at a speed of 68 km/h. The maximum can be reached after about 17 cycles, and requires about 80 seconds of swinging. It costs about 250€ for each “performance.” The cost might explain why they don’t always swing Botafumiero. Then out we went to find the Pilgrim Office, getting drenched in the process. We filled out a form and presented our credenciales, showing how far we had walked. 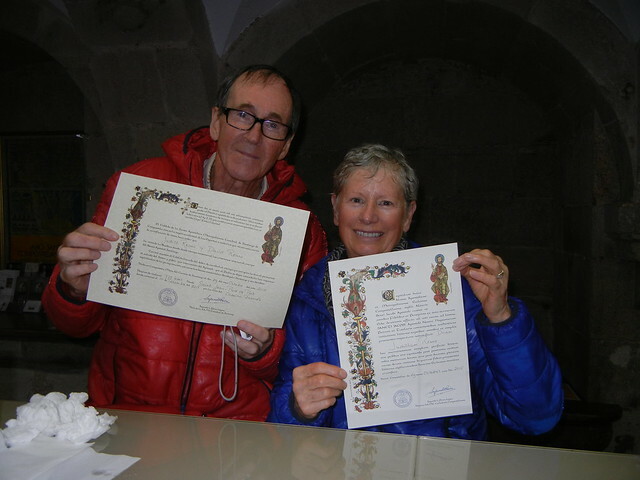 What a proud moment it was when we were presented with our individual Compostela as well as a certificate that shows we walked 775 km. According to our calculations, we walked even further (818.1 km) because of the longer, alternate routes we took. A big, huge “thank you” goes to Tania for handing the Camino baton over to us and to friends and family who came with us on this journey vicariously, giving us encouragement all along the way. Judy, it has been wonderful to read and reread your adventures over these 50 days…although I missed daily. It seemed I was always catching up 5 or 10 days at a time! Your progress is not just a milestone of miles but as you mentioned in this last post, about putting life into perspective. I know you are proud of your walking and think that the achievement is in dreaming and following thru! Congratulations to you both!! Congratulations on your awesome achievement and sharing your journey so eloquently! I feel truly honoured to be in your circle and look forward to hearing more in person. Safe travels home. Congratulations, Judy and Dave. What a monumental feat. As much as I enjoyed following your eloquent blog, I have not been inspired to ever do the same thing, so am so glad to have had this opportunity to do it vicariously with you. Looking forward to seeing you at the bridge table soon, and hearing in person, more about this amazing trip. Such a long way you travelled. Amazing journey. All on the Peninsula waiting patiently to see your shining face. Safe travels home. It was a real pleasure to go along with you on your adventure in Spain. The photographs really gave the narrative a lot extra. I will be keen to follow your next adventure whatever that maybe. Hi Judy & Dave. Sorry we’re a couple of days behind in your blog – today is Halloween back home and we’re preparing to go out ‘trick or treatin’ with our grandkids. Such warm hugs and congratulations are extended to you both on achieving the completion of this “dream of a lifetime. In the photo of you holding your Certificates you both look like “you’ve already let the light in” and the photo of Dave enjoying the vino gave us both such a chuckle. So please bring that ‘light’ back home with you – the world needs it – and safe travels. Look forward to seeing you again soon. Whoohoo! What an amazing experience and journey you have had and what wonderful memories you will have – such an accomplishment! It must be bitter-sweet. Enjoy your journey to the ocean and the ‘end of the earth.’ We’ll look forward to seeing you on your return. Congratulations on completing your great journey! I hope it was life changing for you both. I certainly enjoyed the journey through your blog. It was so well written and gave me a a real feeling of what you and Dave were going through each day. Enjoy the rest of your trip and we Sidneyites all look forward to your return. Yessssss you made it in fine style… in the rain!!!!! Say hello to Finesterre for me. My way of seeing and experiencing has changed. And I only hitchhiked along on you amazing blog. I can only imagine how different everything will seem for you and Dave. You have achieved what you set out to do and, no doubt, so much more. Look forward to seeing you back home. Congratulations. Like you I walked into the city in rain. I took it as my final cleansing before starting new. I liked the rain most days and seems the rain happened walking into Santiago and again walking up to the Lighthouse in Finisterre. 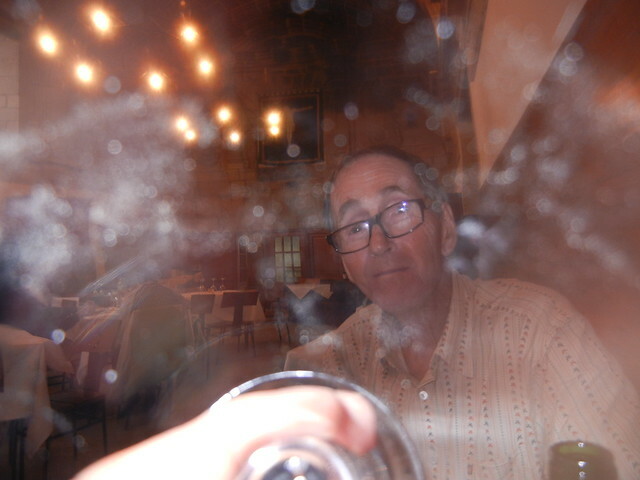 I met your daughter on the Camino. She is a wonderful woman and you both have raised a fantastic lady. No matter the weather or situation she always had a smile on her face you could see a mile away. I also see where she gets her writing and photography skills from. Thank you both for sharing and welcome to the Camino family. It is a great club. Enjoy your time in Santiago and I can not wait to be back there next september. Enjoy the satisfaction of your achievement. You had an amazing 800 k. journey. Thank you all so very much for being there with us for the last 50 days. We loved sharing our experiences – the good and the bad. It motivated us to know you were interested in our big adventure. We didn’t go to Finisterre after all because the weather was still awful. Instead, we are in Portugal and thinking of finding some hills to hike! See you sometime after November 16th. Well done, you two. An awesome journey! 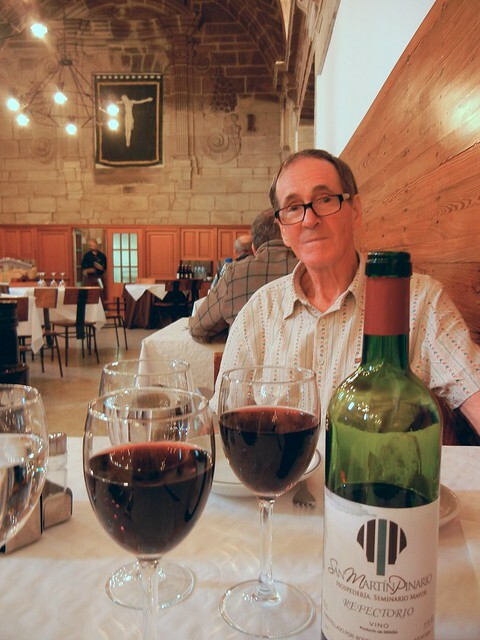 What a way to begin the 70″s with an adventure along the Camino – most thought provoking, interesting and wonderful memories you have created! Better than “Rick Steve”s” documentaries. We will salute to a glass of wine when you arrive home. Ah! I enjoyed it all, and only got to Santiago today. And now I know where you have gone before coming home. We are having lots of rain too, so no need to hurry! 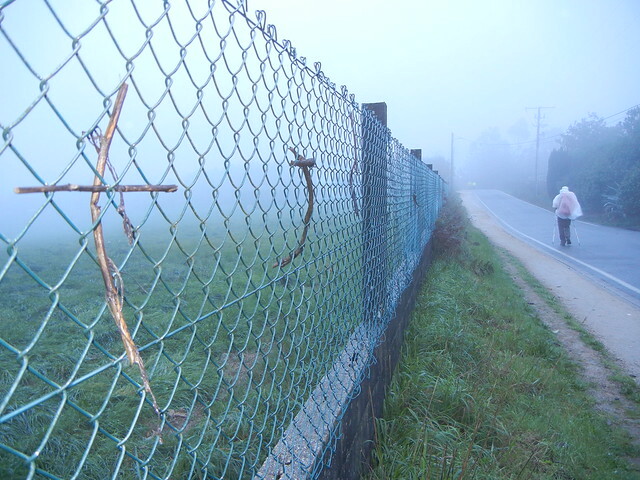 I always thought I’d like to walk the Camino, and now I’m sure I would. Thank you for sharing your inner joy with us all, Judy and Dave. It is most inspiring. Enjoy relaxing in Portugal, even if you need a hill walk now and then. It would be so wonderful if you walk the Camino! Let me know if you would like any help in planning!!! See you soon. What a treat to follow your blog and be reminded of wonderful memories, and see the things we missed along the way. Well done to you both! Your photographs and writing are most inspiring, and we look forward to reading about your next adventure. Best wishes, David and Jane. It was great having you along on our adventure. There are so many favourite moments and every day had some. 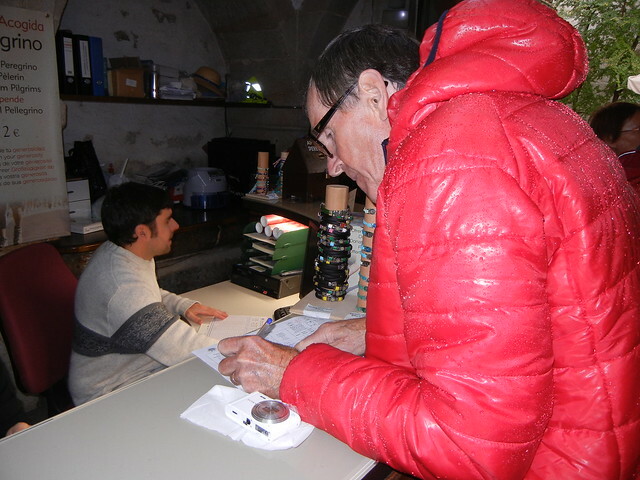 The day between Calzadilla de los Hermanillos and Mansilla de las Mulas was amazing, and that was the day that connected us with you. Even more amazing for me was the previous day, Sahagun to Calzadilla (loved that little ghost town)! Judy. What an amazing accomplishment! 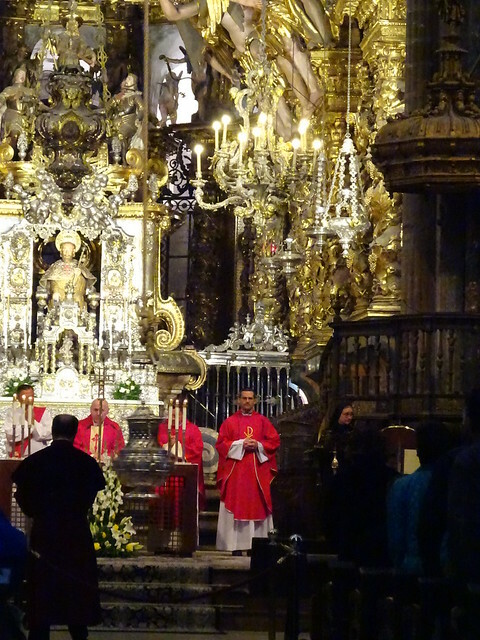 Was the goal to arrive in Santiago De Compostella, or was it the journey? Having walked for 50 days, and having arrived at the ultimate destination, how do you fill the days that follow? You have developed a system of getting up each day and trudging along, enjoying the peace and tranquility, experiencing new things every step of the way, meeting new people, reconnecting with some you have met before, encountering minor hardships, feeling lost, then being found. I can’t wait to find out what comes next! Do enjoy the rest of your adventure, and looking forward to seeing your smiley faces in person! Thanks, Shelley. We’re glad you liked the journal. It was an amazing experience – always an adventure setting out in the morning, not knowing what we were going to see or who we were going to meet. I miss it! What can we say except, “Wow” you did it. Congratulations, we are very impressed and will want to hear many more of your stories when you return. Sorry for the late reply.